Don West - he's the guy who could BLOW YOUR MIND in the wee hours of the night hyping second-year Jim Abbotts, junk sets and the set he's shilling below: Collector's Edge. Yes, Collector's Edge. In his own words, "IT'S GOT ALL ROOKIE CARDS! Basically." Wow, Don, you were such a puppet master of the good deal. Today Don has moved on from Shop @ Home and onto bigger and better things: professional wrestling commentary. He might not be with WWE, but he's got Kurt Angle and TNA covered. TriStar recently released their TNA set and included was a stellar checklist (for us wrasslin' fans) of the companies top stars. And Don West. 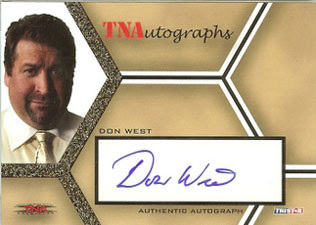 Yes, Don West! YOU'RE NOT GONNA BELIEVE IT! HIS SIGNATURE IS GOING TO BLOW YOU AWAY! SURELY WITH THIS YOU'LL BE ABLE TO RETIRE AND SEND YOUR KIDS TO COLLEGE - TWICE! BUT THAT'S NOT ALL. WE'RE NOT STOPPING THERE. WE'VE GOT MORE! DUAL AUTOGRAPH, BABY! 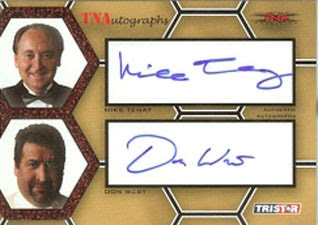 Mike Tenay AND DON FREAKIN' WEST! DON'T HAVE A HEART ATTACK WHEN YOU PULL THIS, BABY! Chris Harris is going to love this.